I'm cooking twelve pounds of my Memphis Dry-Rubbed Wings for a game day party this afternoon, and I thought it would be fun to make a few hot and sweet wings for the adventurous folks. What started as an experiment turned out fantastic, if I do say so myself. Don't let the name scare you. Yes, these are hot, but they're not rip-your-lips-off hot. Well, at least not until you hit about the fourth wing. As a case in point, our eldest daughter (13) ate one last night and wanted another. They really have a great balance of heat, sweet, and smoke. The heat for these bad boys comes from Oakridge BBQ's Habanero Death Dust, and they are slathered with a silky sweet and slightly tangy glaze of mango-peach pepper jelly and melted butter. If you can't find the jelly, standard pepper jelly or an apricot-pineapple jelly (or a mixture of both) would be great as well. If you are a hot wing fan, I highly recommend that you give these a try. They are honestly some of the best I've ever had. 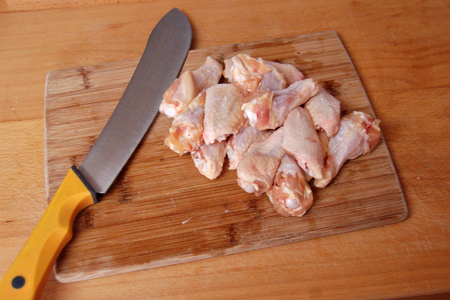 Cut the tips off of the wings then cut them into sections, removing any excess skin and fat. 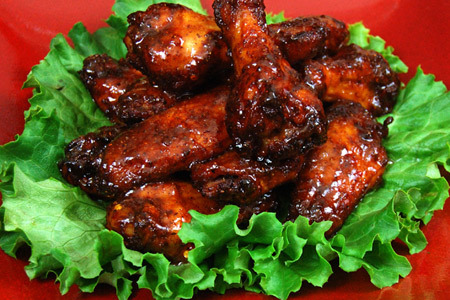 Put the wings and salad dressing in a gallon-size zip-top bag and slosh the wings around so that they are all coated. Seal the bag, removing the excess air and refrigerate four hours. 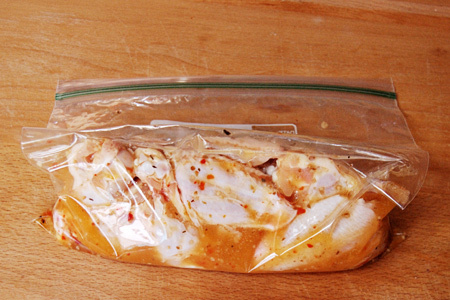 Drain as much of the dressing as you can from the bag (or move the wings to a new bag), and add 1/4 cup of the Death Dust or whatever seasoning you're using. Squish the wings around in the bag so that they are all coated, and refrigerate one hour. Start your grill and prepare for indirect cooking over medium heat (325-350º). I used a combination of Kingsford® Competition Briquets and mesquite lump charcoal. Put the remaining 2 tablespoons of Death Dust in a shaker. Cook the wings indirect for 20 minutes, then flip them, spray them with a light mist of canola spray, and dust them lightly with the seasoning. Cook 15 minutes more, then repeat the flip, mist and dust process three more times, every 15 minutes. Combine the jelly and butter in a medium microwave-safe bowl and microwave until the butter is melted, then whisk well to combine. Coat each wing with the glaze and cook 10 more minutes. 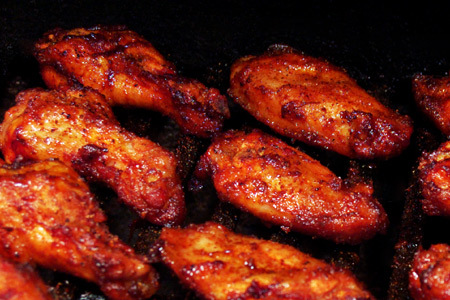 Glaze each wing again and remove them from the grill to a platter. Serve with the remaining glaze for dipping and enjoy (with caution)! I know these taste amazing. Anything with mango and/or habanero is something I'd love. These look very delicious and flavorful. Yum. John looks good. I will have try this next weeked with some bone in chicken thighs. I have all of the Oakridge rubs except the habanero death rub. I will use the one that they have for chicken. 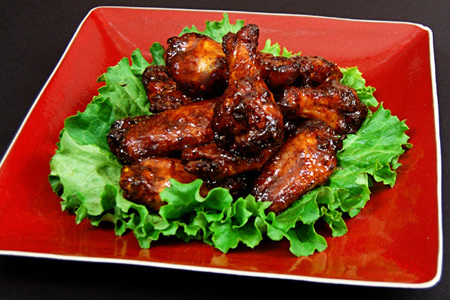 Also wanted to let you know that I did your memphis dry rub wings using your Memphis Dry Rub from this site. I applied the rub and then smoked drummettes and flats and added a jalapeno sticky sauce. The sauce is not my recipe but something out of Williams and Sonoma book. It is essentially, Jalapeno Pepper Jelly, honey, butter, salt & pepper, chile powder, Cayenne, paprika and diced up fresh jalapenos. I added severaldashes of Chipotle tabasco sauce. People killed them at the SB party that I brought the wings to. This is very similar to your recipe above. Will let you know how it works out. Anonymous - I'm really glad that your guests enjoyed the wings. It's all about happy eaters, right? What was the brand of mango-peach pepper jelly that you used? I used a brand called "America's Northwest". Of course, Google will turn up some other options. so well named, these do look like death. delicious, delicious death! John made these over the weekend. My only mistake was that I marinated the wings in the Italian dressing too long so the texture of the wings after cooking was a bit mooshy. 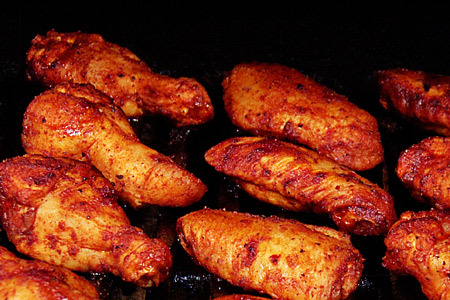 In any event, after the marinade I use the Oakridge Game Bird and Chicken Rub. Before adding the sauce the wings were pretty tasty (next time I will be careful about the marinade time). For the sauce I could not find the brand you mentioned. I had to improvise a bit and used 6tbs of butter along with 1/4 cup each of mango chutney, spicy marmalade chutney and pepper jelly. Heat was not enough so I added a bit of cayenne, chili and paprika and a few dashes of Chipotle tabasco. Came out pretty good with the exception of the texture of the chicken wings. I will be ordering the habanero death dust and the jelly you recommended above so that I can follow it exactly next time. Good stuff.